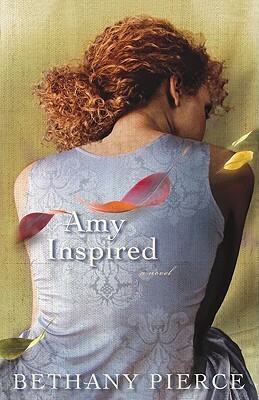 Amy Inspired is not your typical Christian fiction novel. So many of them slap you in the face with a sermon. This does not. I think that is what I really liked about the book. Amy, the main character is full of flaws. She proclaims she is a Christian, yet she makes the same realistic mistakes that many Christians make. That doesn’t make her less a Christian, just more realistic. Amy is an aspiring writer. To live she accepts a teaching job at the university. Her writing passion shines as she teaches her students the finer points of writing. Unfortunately she is amassing a stack of rejection letters for her own writing. Feelings of happiness and jealousy rage as her friend and roommate Zoe gets an article published in a national magazine. Then Zoe lets a friend move in with them until he can find a job. Amy is attracted to Eli Moretti. He is everything that she has never wanted in a man. Eli is a tattooed, scruffy looking, an artist that lives life more freely than Amy has ever dared. It is exactly this type of man that helps put things in perspective for Amy. He causes her to question things. There was so much I could identify to in this story. I like Amy make lists and have stacks of post it notes. My family teases me about my lists for my lists. I often feel I do a better job inspiring my students in their writing than I do in my own. I loved the way the author showed the human side of Amy. Things like jealousy, dealing with death, and family issues were handled in such a realistic way that anyone reading this could find something to relate to. This was the first book I had read by this author and I thoroughly enjoyed it. I will definitely recommend it to my friends both Christian and non-Christian.